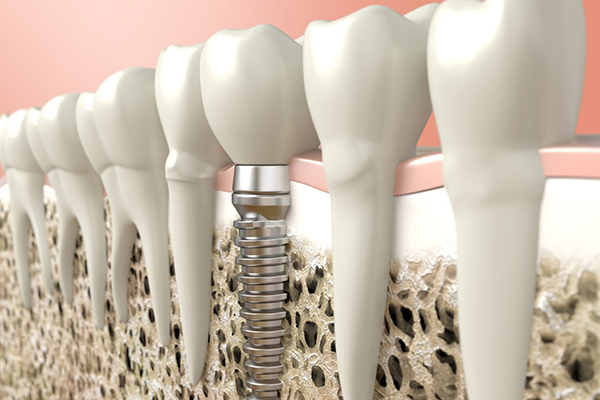 Dental implants are the most popular choice nowadays for tooth replacement. They’re a low maintenance, long-term solution for missing teeth. But just how long do dental implants last? Are they a life-long solution or do they need to be replaced now and then? Your dentist in Abbotsford can answer all your questions and discuss what kind of restorative dentistry is right for you and your lifestyle. To understand the longevity of a dental implant, you have to know a few basic things about its physical makeup and different parts. The implant itself is a titanium post screwed into the jawbone, which acts as the root for the new artificial tooth. This root can last a lifetime, rarely needing to be replaced except in the case of misuse or illness. Attached to this is the dental crown, which looks and acts like a real tooth. With proper dental hygiene and twice yearly check-ups, your crown should last at least 10 to 15 years, and those with impeccable dental hygiene can expect it to last even longer. Brushing twice daily. Use non-abrasive toothpaste and a soft toothbrush. Stay away from baking soda toothpaste and smoker’s toothpaste as these can scrape and weaken your dental crowns. Remembering to floss. Use non-waxed ribbon floss every day. Although the implant itself is made of titanium and cannot break down, the gums surrounding the implant can become inflamed causing gingivitis and periodontitis. Not skipping dental examinations. Visit your dentist for checkups twice a year. You’ll get a full cleaning and have your implants inspected. Watching what you chew. Avoid sticky foods like sugary gum or very hard foods, which could dislodge a crown. For dental implants near the front of your mouth, be careful of your oral habits, such as biting your nails or chewing pens. This may cause your crown to chip, requiring replacement. Looking after your gums. Take good care of the tissue surrounding the implant as it’s prone to inflammation. Consider using a water irrigator (WaterPik) to keep plaque and bacteria under control. Creating a routine. An at-home oral hygiene routine is imperative to the longevity of your dental implants. The dentist at Medora Dental Care in Abbotsford can discuss the steps you need to follow to keep your mouth healthy and your smile beautiful. Medora Dental Care performs safe, restorative dentistry procedures like installing dental implants and dental crowns to those in Abbotsford, Chilliwack and Mission. We’re committed to creating a comfortable, stress-free experience and offer the latest technology for pain-free dentistry. Contact one of our caring staff members today.